A GRReat start to your IdentaPet protection for YOUR pet! I call these my "FUNCTIONAL" tags, because they serve both a "FUNCTIONAL" purpose as well as being a "FUN" tag for the "do-it-yourself" caregiver! They are a simple, effective and efficient way to place identification on your dog or cat. Tag measures 1 1/4” in diameter. Plastic cover resists normal elements, assuring that your pet's information stays safe. Why I like this tag is because your information can be changed as many times as necessary. When going on vacation, kenneling, having a temporary caregiver, moving, or a change of phone number. Simply fill in a new piece of paper (for added durability use a waterproof pen), insert in tag, and voila' -- instant updating for your pet’s security! An idea that fits in purrfectly with IdentaPet's mission of preparing for your pet's well-being at all times. During emergencies such as hurricanes, earthquakes, etc. the information can be updated to include an “out of area” contact’s phone and/or cell number. Should you and your pet become separated, and if “pockets” of local phone lines are down for any period of time, this may be the only way to notify someone should your pet be located. 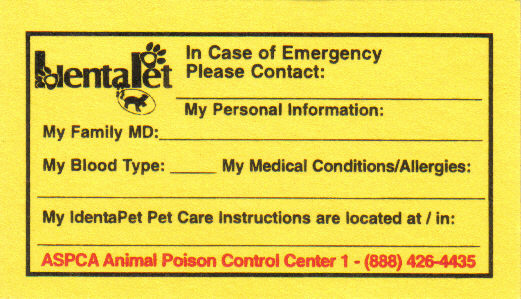 If your pet already has ID, this can be your “just in case” tag for any and all of the reasons mentioned above! These tags also make great PHOTO ID Tags, so you have a choice. Simply fill in the information or be as creative as you dare! Click on Image for a larger view of "do it yourself" tag designs. Tag designs are only limited by your imagination! My spoiled furkids even have their own holiday design tags. When making your own insert, simply remove the clear plastic cover and use as a template. And if you worry about sending away for tags and giving “third parties” access to your private phone number, these tags are an added security measure at a time when personal information is being raided at an alarming rate. Tags are available in four vibrant colors of OUR choosing . . .
red, green, yellow and blue. All are attractive and your pet will look purrfectly grreat wearing any one of them -- but more importantly, should they get lost, they have a better chance of being returned because you cared enough to protect them with identification. 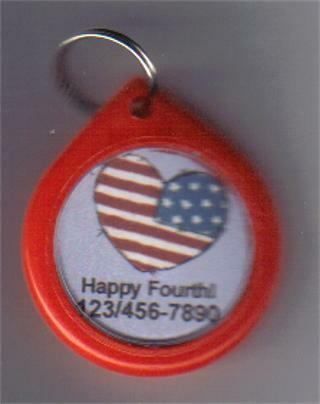 Tags come with easy attachment ring for your pet’s collar. INSTANT PET ID for INSTANT PET PROTECTION! is NOT ENOUGH to protect you . . . or your pet! alert personnel that you have pets at home! I wanted only the BEST for my IdentaPet caregivers! Our key tags are NOT acrylic! They are amber colored propanate! of caring for your pet! who care about YOU when YOU might need them MOST! "My Pet is Traveling with Me Today!" their life in an accident! as well as where your IdentaPet instructions are located. until you can care for them once again! For use ONLY when pet is on board. and travel time with your four-legged furkid! or place on car visor! Pet Care instructions are located. life-saving aid for any emergency. on the sticky magnet front. That's it! know who to inform of your situation! in an EMERGENCY or while you are on VACATION! and most importantly, PERSONAL INSIGHTS. and you can't be there to speak for them! a time you can't be there with them. with listing of all parties to contact with phone numbers. and what to do should your pet be lost or stolen. time-saving, well thought out plan of action. should they be lost or stolen. even total strangers to recognize your pet. PROFESSIONALLY DESIGNED FLYER to say it on! in the space provided, make copies and distribute! A BRIGHT Idea . . .
from one of our SATISFIED PURRRchasers . 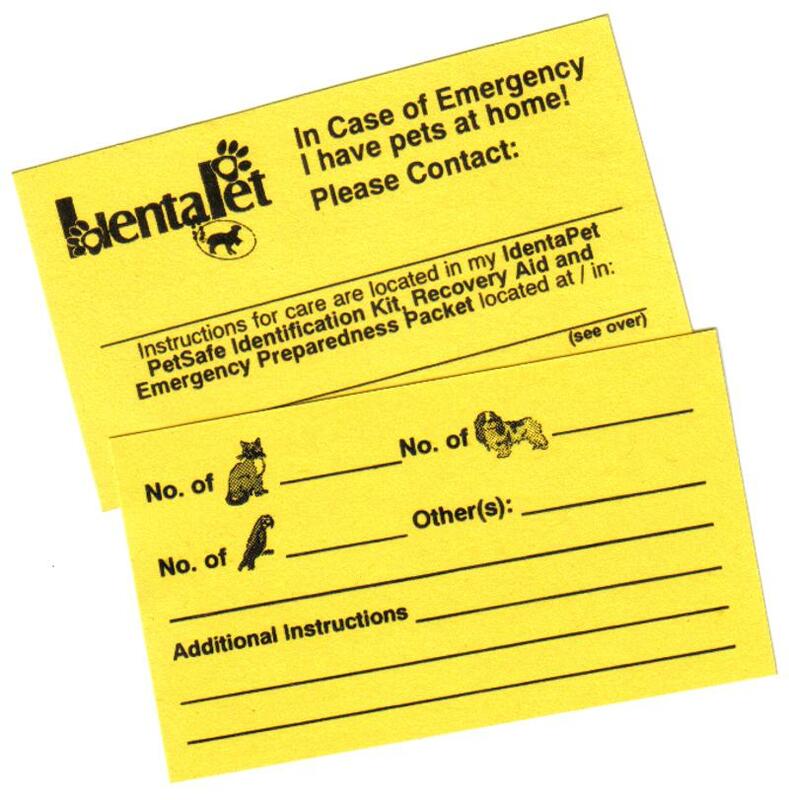 . .
to protect and store your IdentaPet packet! This visible aid alerts emergency personnel in your community that you have pets should the unexpected happen when you are away from home or are unable to speak for them. What a PURRfectly GRReat way to complete your pet's IdentaPet protection! These non adhesive stickers can be placed on any window. They work by static cling so they can be easily removed and positioned in a new location. Stickers boldly announce "Animals Inside". Simply fill in your contact information and you can rest easy knowing that your pets will be well taken care of during an emergency. IdentaPet Packet Contents . . . Fill-in Phone Directory . . . Tips & Strategies for Finding Lost Pets . . . Detailed Identification Sheet . . . Reward Flyer . . . Emergency Section with YOUR Pet Care Instructions and Vital Information . . . Wallet Size Emergency Card . . . Key Tag with Ring . . . Car Travel Hanger . . . Storage Pocket for Photo and Paperwork . . . Pet ID Tag . . . I ACCEPT! MY Pet's FATE shouldn't be left to CHANCE !!! Want to know more "About Us" and how IdentaPet was born?